The Wonderdogs team shows you how to play it safe! Learn important safety tips and how to implement them when training dogs of any size and temperament. We spend a minimum of 3 hours on this very important topic. During the Professional Dog Trainers Program, you will also learn about how to keep your client’s dogs safe while at home, at training and everywhere in between. This information is extremely important and is covered extensively in the course. We spend a minimum of 2 hours on this topic. Canine First Aid basics are also covered in the program. My husband and I were travelling to the interior of BC, when we stopped at a gas station in Princeton. The gas station is right next to the highway and a bridge, and there is a trail running along the river under the bridge. Our 1 year old Australian Shepherd, Fawn, got out of the car with us. We each thought she was on the other side of the car, and when we realized that she was not with us, I began calling her. As I walked up the bank toward the highway, I saw her. She was obeying me exactly as I had trained her and was running toward me– right toward the highway. I yelled “down!” as loudly as I could, and she dropped right along the edge of the pavement as a pickup truck flew past. I have no doubt that if she had not been trained, and had not dropped instantly, that she would have been hit and likely killed. She lived a happy life to the age of almost 13. I am now training my second Aussie, Ghillie, who is now just a year old. I am very confident that her training with Ben will be equally important as she travels with us everywhere we go. I highly recommend Ben Kersen and the Wonderdogs training, for dogs and their people. This component of the Professional Dog Trainers Program will give you an understanding of how dogs reason and respond to the environment in which they live. This information is the foundation of any training, and an essential part of evaluating a client’s dog. At five weeks of age a puppy displays numerous personality traits. The Wonderdogs team shows you how to select a puppy for its health, intelligence and temperament. Our team use our own tests as well as those used for the seeing eye dogs for the blind. The Wonderdogs techniques for socializing and conditioning a puppy to the stress and noise of modern society are very effective. This is an essential part of a puppy’s upbringing, ensuring a stable temperament for future training. Our foundation training is an excellent start for any dog, young or old. Fun, nurturing, and stress-free for dogs, this concept is unique and integral to his training technique. I found the course exciting and extremely informative. Since graduating, I have helped clients with basic obedience and also taken jobs within the film industry. Invaluable in the understanding and training of dogs is a working knowledge of dog breeds and the various temperaments and characteristics associated with them. Would you believe that most dog owners lose hundreds or thousands of dollars worth of personal property before enlisting the services of a reputable trainer? The results from our counseling for problem behaviour are remarkable. The feedback received from thousands of clients over the past three decades indicates that problems such as aggression, housebreaking, jumping up, barking, chewing, digging, and many more are often resolved within 2-3 days. I own a 2 ½ year old Rottweiler. I went through obedience training with three other trainers. Even with all this time and money spent on training, the dog was still totally out of control. He would jump up on people and was aggressive toward other dogs. It was to the point where I would only walk the dog early in the morning or late at night when no one was around. This was no fun for me or the dog. I was at my wits end. It was try another trainer or do something more drastic. Then I read an article on Ben Kersen and the Wonderdogs. I decided to give him a try. After talking to Ben he said it would take about ten sessions to fix the problems. I started working Ben. We started working on the dogs problems of jumping on people and his aggression towards other dogs. Within two sessions the dog was no longer jumping on people. Ben would bring his dogs out so we could fix the aggression problems. Ben told me how to correct the dog when he showed aggression, then he would work his dog around mine until mine was no longer aggressive. Within a few short sessions the dogs were playing together. We also worked on basic obedience. Ben helped me get rid of bad habits I had when doing obedience work with the dog. In the end Ben’s method of training worked where all others didn’t. You can save yourself a lot of time, money, frustration my going to Ben to have your dog trained. I know I would have done it in the first place. I went from not being able to take the dog around people or other dogs to being able to take him anywhere. This method of training gave me back a piece of mind and saved the dog’s life. Teaches your “canine clients” to jump back every time a car is heading towards them. This training can be a lifesaver for dogs living in urban areas. Teaches any dog to stay inside the property line when left out in the yard, regardless of the distraction. How to teach dogs not to take food from strangers or to scavenge it off the ground, but to accept it only from their owner’s hand or their food bowl. We also cover coprophagy during this topic. The Wonderdogs team will teach you how to train your own trick and frisbee dog(s) during the Professional Dog Trainers Program. We will draw on our many years of experience to show you how to create your own wonderdogs and make top dollar as an entertainer. Watch the Cool Tricks video to witness the amazing routines that Ben’s Wonderdogs have performed across North America. Pricing: how much should you charge per show? How to promote yourself during your show – company vehicle, T-shirts, signed photos, etc. Spin-off income: sale of t-shirts, videos, dog training lessons, etc. Ben has had so much enjoyment performing with his dogs over the years, and now he wants to share that with others. Graduates of the Professional Dog Trainers Program will be invited to make guest appearances at Ben’s shows for some first-hand experience!! Truly a gifted, results-oriented trainer, Ben effortlessly combines his dog training practices with a teaching style that is professional, effective, and fun! Retrieving any object, using directions (right, left, and straight), send-aways, take it and drop. 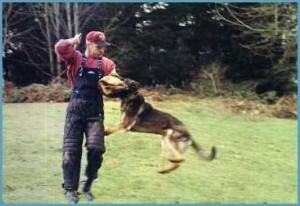 There is a big difference between a highly trained personal protection dog and a “junk-yard” dog. The top Schutzhund dogs in North America are fearless and ferocious when competing, yet they are absolutely dependable in day-to-day situations. 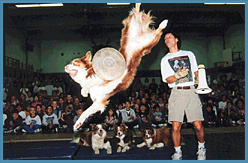 Over the years, Ben’s Wonderdogs were in the public year round and are routinely mobbed by boisterous children after their trick and frisbee show. It may surprise you to know that they all had an advanced level of personal protection training. 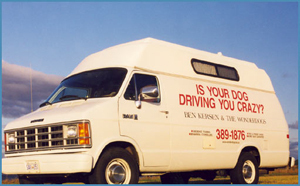 Over the past two decades, The Wonderdogs team has trained numerous dogs for movies, TV, and advertising. They will share all their hard-earned expertise in what can be a “dog-eat-dog” industry. This work can be extremely challenging and rewarding and bring out the creative side in any “dog wrangler”. Topics include written contracts, arranging payment in advance, and negotiating the best deal for your time on the set and for all your “extras”. We will teach you how to make a healthy profit providing these high-demand services, while avoiding numerous pitfalls. Dog Walking Get in great shape and make money when you take your client’s dogs out for a run! Dog Sitting Make money pet sitting while living rent-free! In-Home Boarding Learn how to set up your own Pet Hotel or Kennel Alternative boarding dogs in your home. Doggie Daycare Learn all about caring for your client’s dogs while they’re away for the day. Do you know what you are feeding your dog? This component of the program will teach you how to evaluate and choose the best food for your dog’s health and of course, for your dollar. In addition we will show you many creative ways to give a dog complete exercise in a safe environment, as well as how to make inexpensive toys that dogs will “attack” for hours on end. Safety and canine first aide is covered extensively within this program. Everything that you will need to know about how to deal with an emergency situation and more will be taught. There is a vast market for flea control services, especially in warmer climates. We will discuss safe and effective means of controlling these pesky critters including chemical free options. Operating any business requires several key components to ensure success. In this section of the program, particular emphasis will be placed on the creative aspect of owning your own training and boarding facility. Also covered in detail the marketing, sales, and advertising techniques that have seen The Wonderdogs business prosper. This includes entertaining with the Wonderdogs at fairs, sports events, conventions, and private parties. Creating an image through company uniforms, vehicles, stationery, etc. Travel locally or worldwide training dogs, selling your training products such as books, pamphlets, and DVDs, and doing training seminars. Even better, enjoy this travel without paying for accommodation!! Designing a resume that will get you the job! Basic income tax information: how to maximize your write-offs and decrease your income tax.